This article demonstrate creating and launching WPF application in it's own desktop in a secure manner. Few days back, I developed one kiosk application which was supposed to run on Windows 8.1 in full screen mode at public kiosk machines. One of the requirement was to load the application in it’s desktop that will not show any taskbar or side bar and access to any other OS’s functions. Quick search on Bing landed me to this CodeProject article which gave me managed wrapper over this unmanaged APIs to access various functions easily. In the supplied sample code, I have put the class mentioned in Listing 1.0 in to TestLauncher project. The method to put attention to is ShowSecureDesktop. This method first gets reference to current desktop. This is required since once your newly created desktop is closed, you need to revert back to your original desktop. We then create new desktop by calling CreateDesktop. 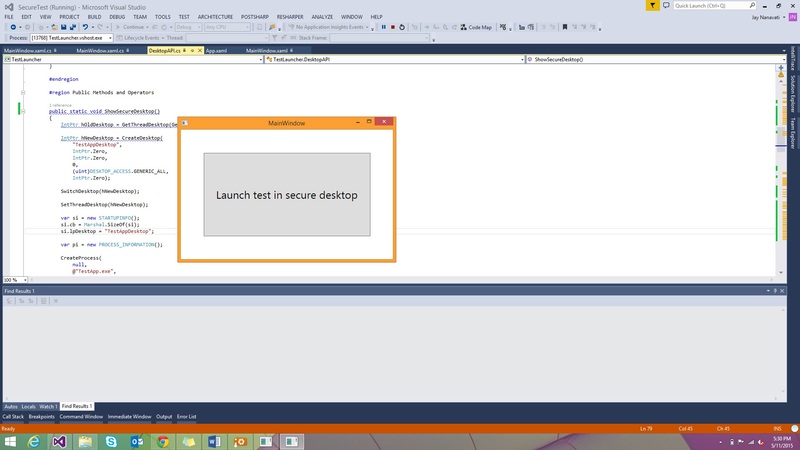 We will then use well known CreateProcess method to launch our test WPF app “TestApp.exe”. 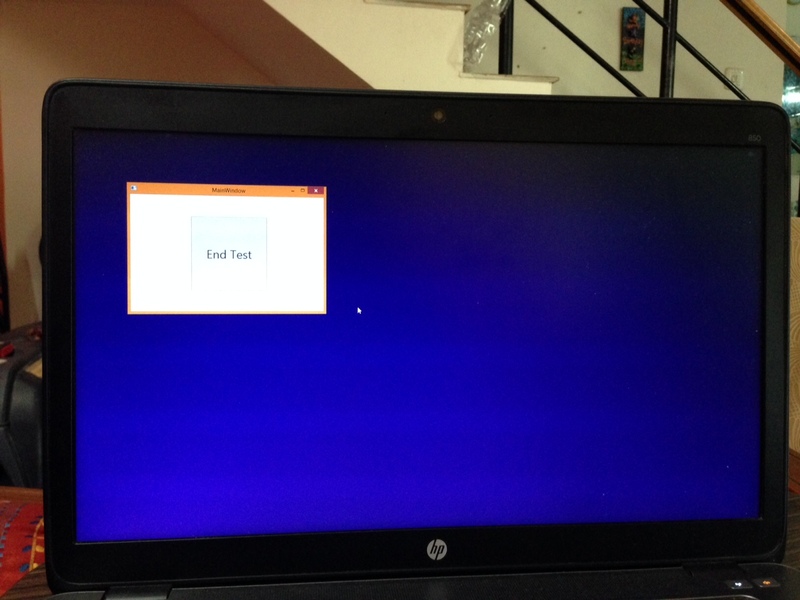 With this, we are also telling process to load this app into desktop named “TestAppDesktop”. This is the desktop which we just created. So as soon as the code gets executed till this point, the new desktop will be created and your application will be launched in that. Now the question is when to close this desktop. In this case, we will switch to this desktop as soon as the TestApp gets closed. For that we can use the WaitForSingleObject. This will ensure that the calling application thread will wait till the process we launched finish execution and terminated. When you run the sample code, you will see that the TestLauncher application will launch TestApp and the TestApp will have End Test button. Clicking on the button will close the TestApp and will trigger switching to original desktop. When the new desktop is created and set, you will see that any sidebar or taskbar navigation are not present. This will also help preventing any other application to gain access to keystrokes or mouse interaction happening as they are in different desktop. The only way you can see running applications is by pressing Alt + Ctrl + Del combination and bringing up Task Manager. You can still disable this as well! I will leave this up to you if you want to try with the sample code provided. Just Bing it!